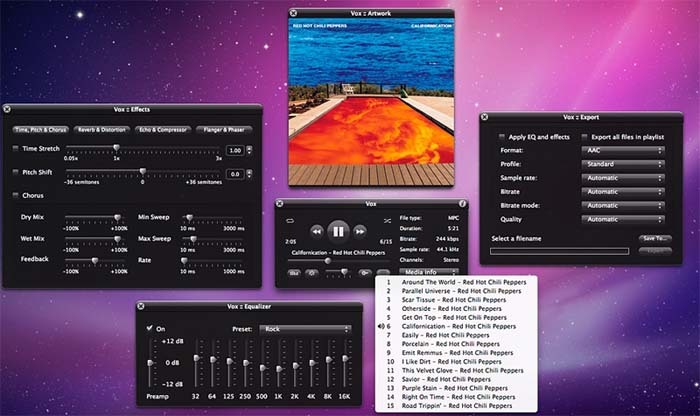 Vox for Mac is a little and simple music player for Mac OS X with support for many file types, including FLAC, MP3, AAC, Musepack, Monkey's Audio, OGG Vorbis, Apple Lossless, AIFF, WAV, IT, MOD, XM, Games Music and many others. Includes numerous effects like Equalizer, Reverb, Time Stretch, Pitch Shift, Echo. Moreover, all supported files can be exported to AAC+, Apple Lossless, WAV and other formats with enabled effects. Qweas is providing links to Vox for Mac 0.2.7 as a courtesy, and makes no representations regarding Vox for Mac or any other applications or any information related thereto. Any questions, complaints or claims regarding this application Vox for Mac 0.2.7 must be directed to the appropriate software vendor. You may click the publisher link of Vox for Mac on the top of this page to get more details about the vendor.